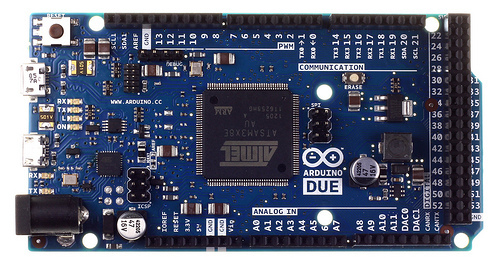 The arduino DUE is different than most Arduino boards on the market since it runs at 3.3V. The board contains everything needed to support the microcontroller; simply connect it to a computer with a micro-USB cable or power it with a AC-to-DC adapter or battery to get started. The Due is compatible with all Arduino shields that work at 3.3V and are compliant with the 1.0 Arduino pinout. The Due follows the 1.0 pinout: TWI: SDA and SCL pins that are near to the AREF pin. The IOREF pin which allows an attached shield with the proper configuration to adapt to the voltage provided by the board. This enables shield compatibility with a 3.3V board like the Due and AVR-based boards which operate at 5V. An unconnected pin, reserved for future use. 32 bit microcontroller: 4 byte wide instructions during one CPU cycle. This gives it much more power than a standard ATmega chip.